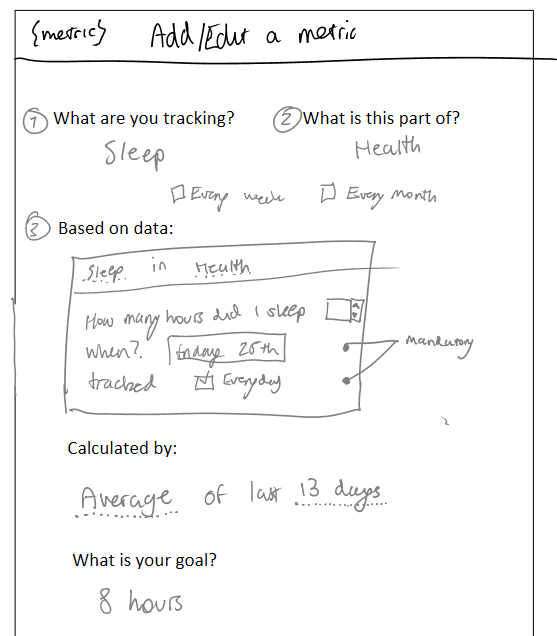 From March to May of this year, I built my own realtime web app for quantitative self called Metric. Here’s a write-up on what made it awesome. An experiment, and my new life’s work. What was cool about it? But the unique selling point of Metric (that I haven’t seen any other consumer app do) was that it was able to make metrics depend on the computations of other metrics, which made possible this crazy idea that I call The Life Metric. Have I been testing often enough? How long have I procrastinated? Did I be my best today? my average blood glucose level is computed as an average of my BGL records for the past week, I try to optimise this to be between 6 and 7. This, combined with other metrics, can give me a percentage representing how well I’m doing in this area (Diabetes). I also care about how much I exercise, as this is good for mood and body etc. So I log this, and this is a metric under the Health/Exercise category. **Now what if I compute a new metric for my overall health, based not on records/inputted data, but on other metrics? **Such that this will change when my Diabetes metric changes (which is because of new data). It turns out this is entirely possible because we are using JS. And so that’s what you can do with Metric. The implementation of the actual Metric computation was fun as well. All Metrics were defined as pieces of JS that were wrapped in an anonymous function. and turned it into a JS function that you could call, with the arguments Metrics and Records. Metrics and Records were APIs you could use in your Metric to access the data of other records and metrics, and perform functions with them (such as averaging). But it didn’t stop there. I decided to extend Metrics and Records with helper functions such as since and the Math functions of the gauss library for averaging, statistics and other stuff. Also the in-browser JS editor did syntax errors and code highlighting. It was a nice touch. How did recomputations and dependencies work? This is one of my favourite parts. I used a JS parser called esprima, written in JS, to parse our JS by walking the AST and identify the calls to these helper functions and thus dependencies to other metrics and record collections in the database. Then I used a library to hook when records or metrics were upserted into the DB and recomputed their dependencies. Issue: there was a point where if a metric depended on another metric it would engage in an infinite loop of recomputation. I could tell naively if another metric had a direct dependency on another and solve this by warning the user when they’re coding it, but unfortunately I hadn’t the time to scan the dependency graph and fix the problem properly. The interface for adding records was one of my most fine achievements with React.js. For those who don’t know, React allows you to build interfaces declaratively, and it’s the future of UI dev on the web. One particular aspect was making it so users could input different types of data and the system’s interface would change the form element accordingly — e.g. a yes/no field would demand a toggle, a number field would a counter, a text field a textboxt etc. The other beautiful thing was the inter component communication was as simple as a callback – there was no other information needed for this – just updating the value in the parent component state. The dashboard is completely configurable such that you can move around different cards containing metrics. This is really helpful for me, because I want to know some things straight up front. I’m so grateful to have ReactGridLayout for this purpose, and I think the ease of the implementation is testament to the React model. It loads the initial state into the React component, finding metrics, grouping them into categories, then adding them. Whenever a category or record changes value (for example, if a metric is recomputed), the database cursor updates this automatically and re-runs getMeteorState. And there is literally nothing else to it. And I think that’s amazing. I documented all my work, from wire framing, to prototyping, on this Tumblr. It was really intrinsically satisfying that every time I completed a feature I was able to screenshot it and post it. I originally built Metric for my uses. I loved learning about all of these different technologies and it has given me a much more nuanced view of building apps. Eventually I realised that my use for Metric had subsided, and after finding a nifty app that performed the same purpose on Product Hunt, I decided to stop working on the project. 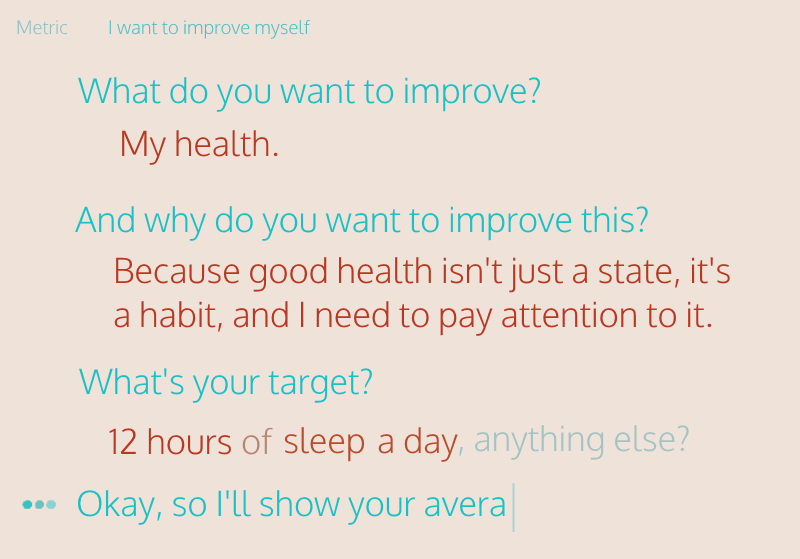 It is worth noting I continued experimenting with the idea of quantitative self, and I built a nice prototype of a Socratic-like dialogue interface in React (inspired by the film, Her). This has been very fun! Next up I want to play with GraphQL and functional React with Om and Clojure. For now, I’m working full-time at a marvellous company and doing uni and trying to do Bitcoin consulting! Many projects = Happy Life! Thanks for reading, I’d be happy to answer any Qs. One in-depth article every two months. Delivered right to your inbox. 21. Blockchain/Full-stack software engineer, Entrepreneur, Writer. Currently residing in The Netherlands, building a product called Berse, and learning.